So far I think we’re doing a good job of living up to our promise of having the most boring (and infrequently updated) Caring Bridge site because Timothy has been doing his job to exit the hospital. Thanks again for your prayers and positive thoughts. We’ve not been on the receiving end of this before and it’s been a real gift, and for that, we also appreciate the folks at Caring Bridge. Our girls and family have all been a big help, but the biggest praise goes to Laura, who has rolled with all of this stuff, spent so many hours at the hospital and has kept a great attitude through it all. Onto Timothy. As expected, Timothy ate like he was at the State Fair once he was off the IV and feeding tube. He has learned very well to eat from the bottle and is getting better at breastfeeding. His digestive system continues to work well, and we’re getting good at changing his little bag. He’s a strong and active boy, now weighing 7 ½ pounds, may possibly need some hearing help, but otherwise passed his health screens. As always, the staff at Children’s was excellent, and after he gained weight, T was granted his release from the hospital. As he was leaving the ICC, it was like the King leaving Graceland – with a few devoted nurses forming a small gauntlet to pay homage to the diapered prince. While I was assembling his crib last night at midnight, my first thought (after ‘how much would it cost to get someone to assemble this crib right now?’) was the realization that after months of waiting and fretting and then weeks more at the hospital, our newest family member was finally here. Having him at the hospital was more like having a package at UPS to be picked up when you had time. Now he would be here for good. No returns. Family of four to family of five – just like that. We just keep telling ourselves that we’ve kept babies alive and entertained before, even if the last one was during the Clinton Administration. 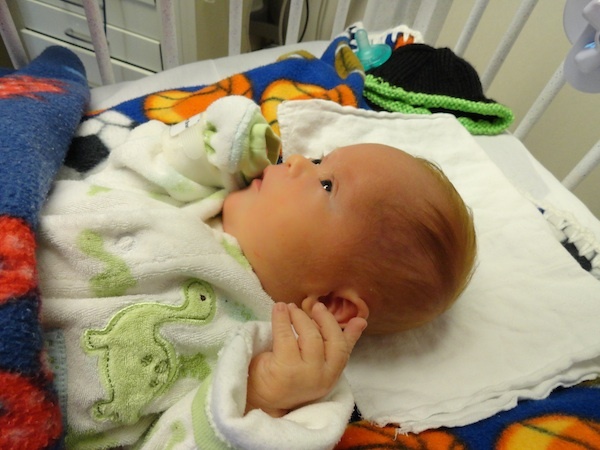 At 11am on September 15, 2011, Timothy arrived home. I am tempted to make jokes about him being a diva and demanding new drapes for his room or finger food with his breastmilk, but his first hours home more mundane. He ate, peed on mom and dad, pooped, ate again, and went with his sisters on an unauthorized 15 minute walk in the stroller. Good start. I should be careful not to be too joking or sound too trite in these entries, like we have this deal all figured out. We don’t. We’re already pretty tired and at times, we’re scared about what could lie ahead. But as I’ve mentioned before (and I use repetition to remind myself) our faith in God is huge, our past experiences will help, we’ll lean on the people in our lives and we won’t stop laughing at ourselves. And we know that we are super lucky, and there will be so many blessings out of this journey, even if we’re sometimes too flustered to recognize them. Thank goodness that we have three kids with good eyes and loud voices and we’re sure that if we miss some blessings, they’ll let us know.